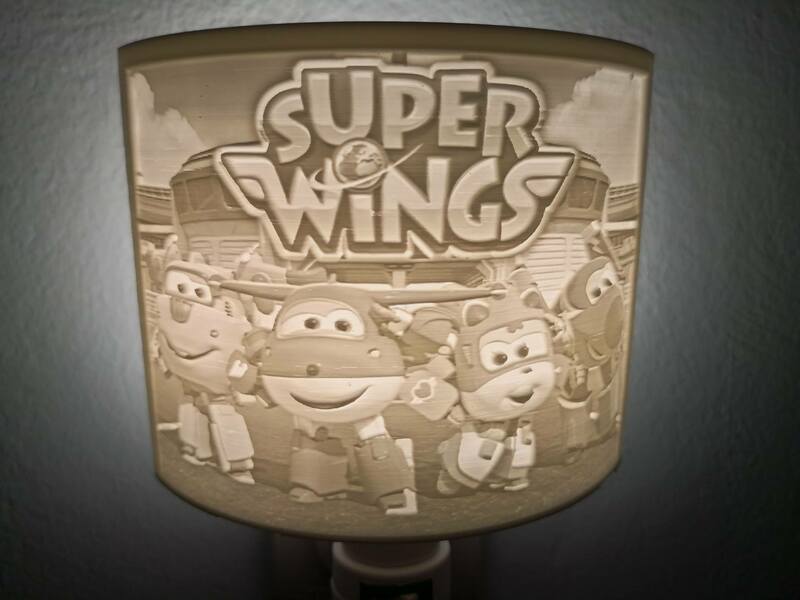 Turn your pictures into 3D stl files of lamp lithophanes, flat lithophanes, night light lithophanes, and more by using the lithophane makers below. Click on a lithophane picture or title to go to the tool that created that lithophane. Instructions on how to use the lithophane makers are on their page, and general instructions on how to 3D print a lithophane are on the 3D Printing page. You can also find someone on the partners page who will 3D print your lithophane for you. Become a partner, or give me feedback by emailing me at [email protected]. I'll add a NEW TOOL to the website if THIS VIDEO gets enough positive feedback in the comments or by liking and subscribing. Check out the video to see the new style of lithophane that I will make available. Turn your photos into a lithophane light box. The lithophane light box was designed to easily take light sockets like the ones you can find here. You can design a customized lithophane light box and crop your photos in just a few minutes using this tool. Turn up to four pictures into a lithophane lamp model using this tool. The tool provides an interface that will work will most lamps. A cutout cylinder with a ledge makes it possible to put the lamp lithophane directly over the lamp's light socket and underneath the light. The default settings work for a lamp that I have at my own house, but I suggest you measure the light bulb socket that you're going to put the lithophane lamp over. Turn a photo into a hangable flat lithophane stl with this tool. This tool automatically surrounds the lithophane with a frame and some holes for hanging the lithophane. Some twine and suction cups can be used to attach the lithophane to a window, and pretty much any will work. We used this twine and these suction cups. 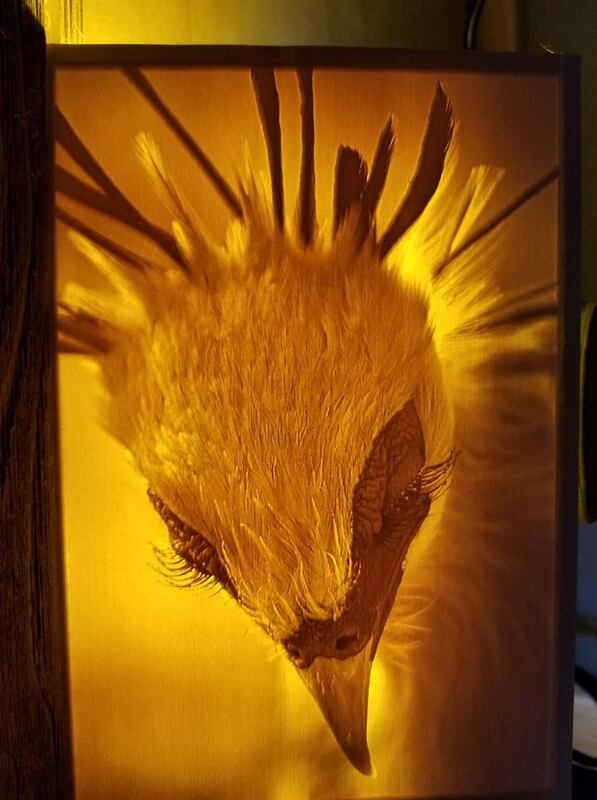 Click the picture above to access the night light lithophane maker. The default settings for the night light lithophane make the lithophane with night lights can be bought here. This webtool gives you the ability to design the night light lithophane to be able to interface with almost any night light! This lithophane design tool creates curved lithophanes or completely round votive lithophanes. You can adjust the dimensions of the lithophane that are shown in the picture to get exactly what you want. This tool with crop an image into a circle and create a flat 3d stl from your photo. The 3d model can have a positive or negative image, so that you can make a lithophane or inverse with this tool. The 3d model is designed to be printed horizontally, and the model comes with a hole for attaching it to a string, hook, collar, or whatever you have in mind! Lithophane Christmas gifts and latest updates! The best Christmas presents have a personal touch, and 3D printing makes personalization easier than ever. Nothing is more personal than memories shared by loved ones. 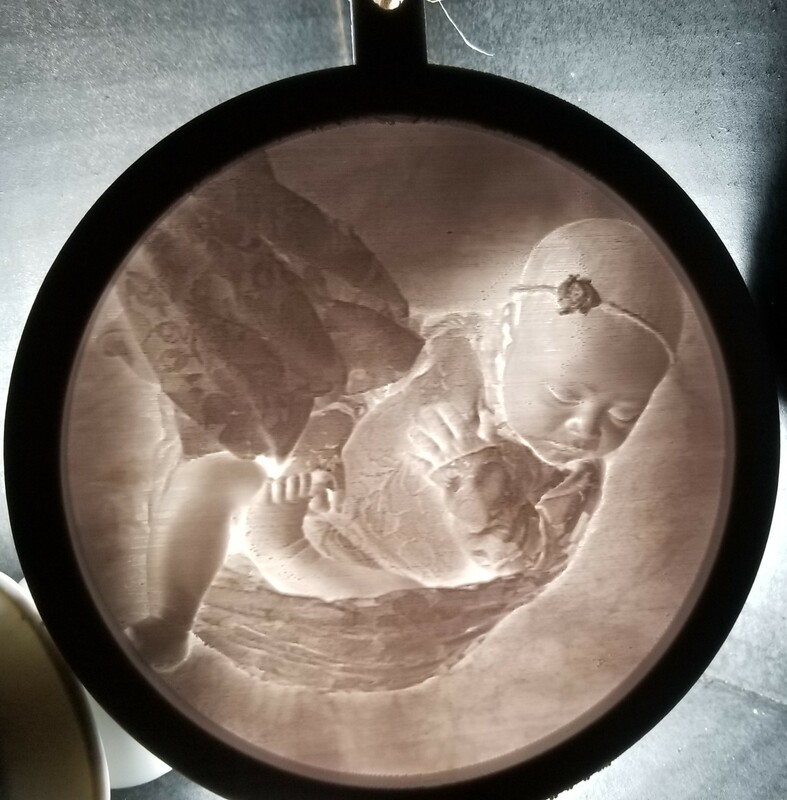 Memories captured in a photo can be preserved for generations, and there is perhaps no better way to preserve these memories than with a 3D printed lithophane lamp. 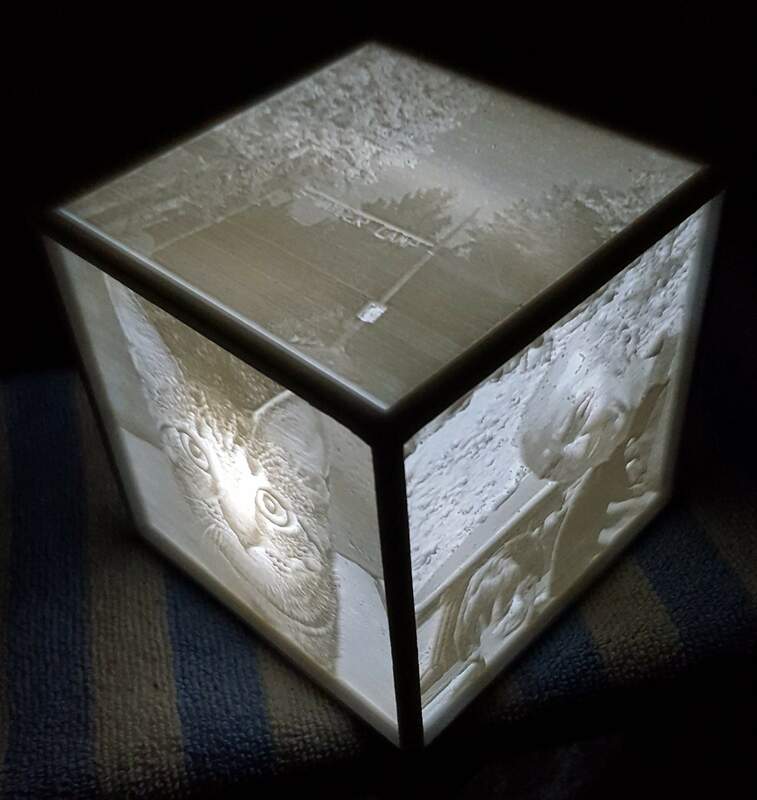 Lithophane lamps are a novel way to display cherished pictures and they make for excellent, 3D printed Christmas gifts. The recently released lithophane lamp maker at Lithophane Maker generates a lithophane lampshade that can fit on lamps you already have in your home. 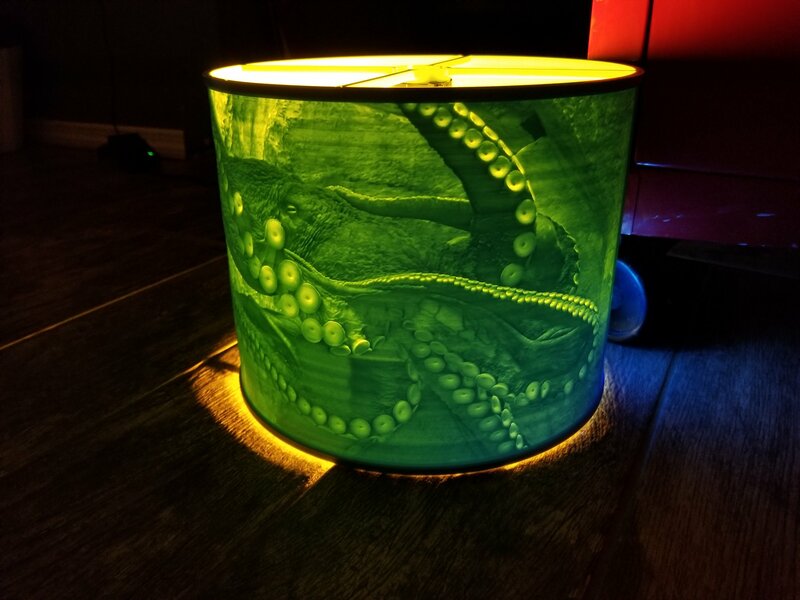 This new process is much simpler than what was previously required to design and assemble a lithophane lamp (https://www.3ders.org/articles/20180315-this-3d-printed-lithophane-lamp-makes-your-photographs-3d.html). Before the tools at Lithophane Maker were available, makers had to 1) buy several items (LED strip, DC Jack, Wire, etc), 2) crop pictures to the required aspect ratio, 3) create lithophanes from the pictures, 4) print the lithophanes and lamp structure separately, and 5) assemble everything together which includes soldering. In summary, this pioneering (but complicated) process requires that the lamp structure, lithophanes, lighting, and power had to be designed and assembled which can be time consuming, error prone, and often very frustrating if the many parts do not fit together securely (or at all). The lithophane maker tool makes this process much easier. The user simply uploads 1-4 pictures, and the lamp lithophane maker automatically combines the images together and creates a custom border and frame. 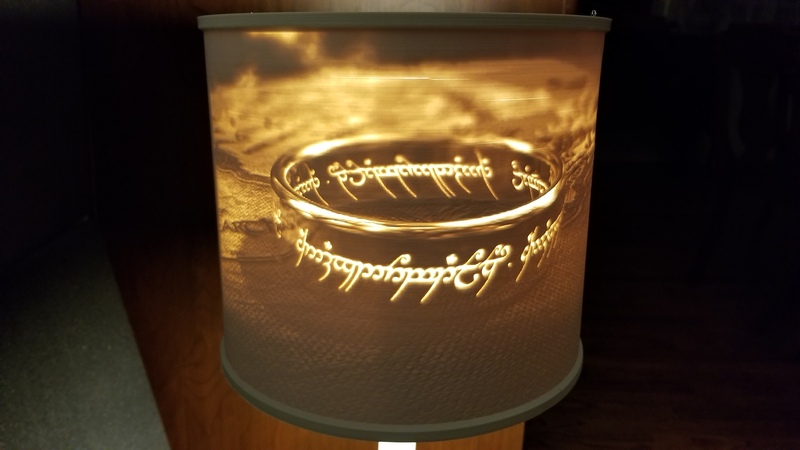 No image cropping or CAD design is required, and the tool turns your pictures into a 3d printable stl model of a 1-piece lampshade that can be mounted to a lamp. You don't have to solder wires together to make custom circuitry that could be a fire hazard. The lampshade's interface can also be customized, though the default settings make the lampshade fit a typical lamp. 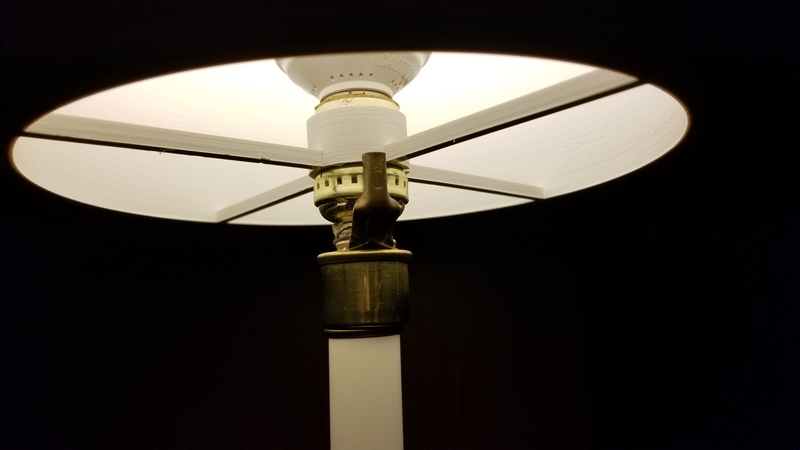 The size of the lampshade is easily adjusted by changing the lampshade's radius and the dimensions of the lampshade's frame. The height of the lampshade lithophane is shown to the user before the lithophane is created, though it is set by the selected radius and the aspect ratio of the uploaded photos. The lamp lithophane maker greatly simplifies the design process, and saves its users quite a bit of unnecessary headache. 1) A frame was added to the night light lithophanes. Turn you pictures into a night light lithophane (here) that is backlit by a night light you already own. 2) The Lithophane Lamp Maker now has a "clamp" interface that gives you a greater tolerance on your interface with the lamp, so that it is easier fit your lamp and takes less time to print. 3) I made the Circular Lithophane Maker more error proof by making it nearly impossible for the user to put the cropping circle outside of the picture. 4) All of the lithophane makers now give you a zipped file that includes your stl file and the settings you used to make the stl file. 5) I updated aspects of the server's back end to make it so that I can debug errors that aren't reported to me. That said, please continue to report any bugs you find, because this works best, and I will fix the error fastest if you ask! Faster server, new lithophane lamp maker, and more updates! As I'm sure many of you have already noticed, I bought a new server that is now significantly faster (about 40x faster) than the server that I used to use. Enjoy! I also just completed perhaps my most ambitious and useful lithophane generation tool so far. It creates lithophanes that can be used as lampshades. The tool's lampshade design provides features that you can easily adjust to make the lithophane lampshade compatible with lamps that you have around your own house. Before this tool came around, lithophane lamps required quite a bit of manual design work by the 3d printer in order to ensure that the lithophane's fit with the lamp structure. Lithophane lamps that interfaced with already existing lamps (rather than the box-type lithophane lamp) used multiple seperate pieces to mount to the lamp. All of these pieces make the whole thing easy to break, though these designs did inspire the single piece lithophane produced by my tool, so I have to thank to designers of those originals. Several bugs were squashed and tools improved since my last post. For example, a bug was found by a helpful user of my tools which caused my lithophane stl models to be incompatible with several commonly used 3D CAD tools that I never use (like Slic3r and Window's 3D Viewer). I found an error in my stl file format that none of my tools seemed to care about, and removed that error. Now those tools can use the lithophane models generated by this website. Additionally, I made some improvements to the Circular Lithophane Maker that make it more reliable and robust as well as making the Circular Lithophane Maker produce models that are rounder instead of pixelated on the inner walls of its frame. Get paid to print lithophanes! We are looking for 3D printers to partner with us to provide lithophane 3D printing services to people in the general public that want lithophanes. 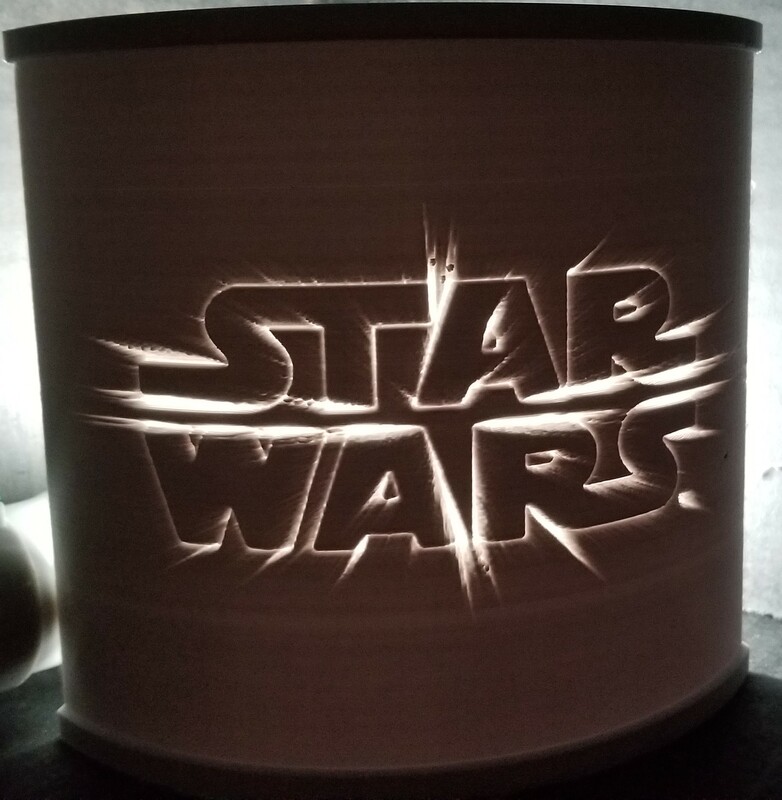 We will connect the general public with 3D printing experts (see our Partners page) who can print lithophanes. We have already partnered with Denver 3D Printing, Brod 2000, and Huntsville 3D Printing. Go to their websites and ask them for a quote on your next lithophane. Aside from lithophanes, these companies also serve the automotive, maritine, and aerospace industries. Contact me at [email protected] if you want to become a partner! The Circular Lithophane Maker is now available! A recent survey of users concluded that you guys wanted a circular lithophane maker. I have completed that tool, and it is now available for your use! You can see an example of what that tool can create to the right. The next tool that I'll make will create lithophane lampshades with the features you need to mount it to a lamp! A faster server is on the way! High demand for this set of tools has made me decide to invest more into the tools. I bought a server that should convert your pictures into lithophane stls about 25x faster than the current server does. I paid for this server out of my pocket, and haven't recieved any where near enough money to pay for it, but I like where this website is going. Please consider helping by becoming a patron or by liking my designs on thingiverse to increase usage. 1. You can now turn on or off the twine tunnels in the window lithophane. 2. Uploading your image will automatically calculate the photo's aspect ratio for you, so you no longer need to provide an aspect ratio. 3. The tools now estimate the time it will take to create the lithophane stl model from your photo. 4. Youtube instructional videos are coming up to make it so you don't have to read all these long winded updates! I sent out a survey to our users and got many respondents and only one person opted out of future emails, so I consider this a win. The survey results WILL affect the tools that I make in the future, so your participation is noted and appreciated. What were the main takeaways of the survey? Of the lithophane generating tools that are currently available, the rankings were 1) window lithophane making tool, 2) curved lithophane making tool, and 3) the night light lithophane making tool. This was somewhat surprising to me, because I know that the night light lithophane making tool is one of a kind. There aren't any other free lithophane software tools out there that make this lithophane. It's good to know the order of these, because it helps me prioritize improvement suggestions from the community (you). If you have a suggestion, please share it with me at [email protected]. The second big discovery answered my question of "what lithophane tool should I make next?" It's hard to understand the categories in the graph, but basically the order was 1) a tool that crops pictures into circles or hearts and puts a frame and hole to make something like a pet tag or a picture in a heart, 2) a lamp shade lithophane maker, 3) a tool like number 1, but for user provided shapes, and 4) a multicolor lithophane generation tool that would convert an image into multiple stl files so that multi-filament printers could print a multicolor lithophane. I have actually already started on the tool that won your approval, and you can see an image of the output to the right. I have yet to make the web interface for the tool, but hopefully it will be done soon. You're probably starting to notice a pattern of behavior. Yes, I like to design lithophane making tools. I am a hobbyist coder as much as I am a hobbyist 3D printer. This latest lithophane design tool makes curved lithophanes with a frame around the top and the bottom of the lithophane. I imagine that in the future, the code will evolve a little more to create lamp lithophanes with a customizable interface to the lamp, but I won't commit to doing that next until after I've gotten feedback from users of this tool on where to go next. I have already received several ideas from the community for completely new styles of lithophanes. Some of those ideas are extremely creative, and maybe I'll talk about them in a future post! Now to the nitty gritty: What do you need to know to use this tool? The scale of the curved lithophane comes from the lithophane height and the aspect ratio of the photo that you use. The Angle you select will determine the angle denoted in the picture (which is hard to describe with words, but here goes) that corresponds to the angle of the arc of the lithophane's transparent surface (sheesh!). Looking at the picture and varying the Angle with the tool should make it apparent. The radius of lithophane is calculated based upon the aspect ratio of your photo, the Lithophane Height that you select, and the Angle you select. Together, these variables set the major dimensions of the lithophane. The frame's size is controlled with the base height, base width, and ledge angle parameters. And just to clarify what the schematic is showing (perhaps I should have explained this up front): on the left is what you would see if you were looking directly down onto the lithophane from a xy plane cut halfway up the lithophane, and on the right you see the lithophane from a plane cut in the xz plane. The ledge angle should be set to whatever angle you're comfortable printing for an overhang, because the ledge angle will be an overhang where the top frame goes to the lithophane image. The maximum thickness and the minimum thickness refer to the maximum and minimum thicknesses of the lithophane image shell. You can use the maximum thickness and minimum thickness values to adjust the lithophane's brightness and contrast. After you have selected your settings, simply upload your photo and out will pop an stl file that is ready for you to slice and 3d print without the need to stich multiple 3d models together. Up until now, I have been balancing run time and lithophane resolution myself. I have decided to let the users determine their own lithophane resolution, but have caped the stl size so that there is enough server RAM to go around. Right now, I'm working on a pretty lean computation budget, but if the lithophane makers really take off, then I will be able to purchase a better server that could potentially cut calculation time for high resolution lithophanes down to a few seconds. The new parameter that contols lithophane resolution is unceremoniously called Lithophane Resolution. You may be able to tell from the units, but essentially, the number determines the resolution of the printed lithophane in mm per pixel. For example, a lithophane resolution of 0.1 would have a unique lithophane depth every 0.1mm on the lithophane's surface. The human eye can only resolve so much, and how much the human eye can resolve is subjective, so I leave it up to you, the user, the determine how much time you're willing to sacrifice to get a certain resolution. This photo to lithophane tool is similar to other photo to lithophane tools that are already out there, but it has some key differences that, I think, make it suprerior. Perhaps its most useful feature is the frame that surrounds the lithophane. This frame makes the lithophane easier to 3D print without it wobbling during printing and falling over. The second feature is made possible by the frame, and that is the tunnels (holes, whatever you want to call them) that go diagonally through the frame's top right and top left corners. Twine or thread can be put through these holes to allow the lithophane to hang from suction cups or whatever else you'd like. There's no doubt that there are many options for twine, thread, and a hook of some kind, but I've used the options that can be found here: twine and suction cups. Okay, so what do you need to know to use the picture to lithophane stl designer? The size of the lithophane is determined by the base length that you enter. I used this as the sizing metric, because it is most likely the side that will be printed on the bed, and it's probably the dimension that is limited by your printer. The height of the lithophane will depend upon the aspect ratio of your picture and the base height and ledge angle that you select. The frame's size is controlled with the base height, base width, and ledge angle parameters. The schematic shows pretty clearly what these variables are, and you can imagine both cross sections of the hanging lithophane to be the same. That is to say: if you took a xy plane cut or a xz plane cut of the lithophane you would see the same thing. The ledge angle should be set to whatever angle you're comfortable printing for an overhang, because the ledge angle will be an overhang where the top frame goes to the lithophane image. The maximum thickness is the maximum thickness of the lithophane image and the minimum thickness is the thinnest point in the lithophane image. That's pretty self explanatory. Just like in my other tools, the aspect ratio is for the maker's visualization capability and does not actually define the final lithophane's aspect ratio. The final lithophane's aspect ratio will be the same as the aspect ratio of the image that you upload. A few days ago I read an instructables about how to make a night light lithophane that had 6 steps to it: 1) create the lithophane model, 2) scale the model to the desired size, 3) prepare the modelling software, 4) draw a lithophane to night light adapter, 5) combine the adapter with the lithophane, and 6) 3d print the lithophane. I decided then and there to make a design tool to reduce the time it takes to make a night light lithophane, because I knew then that a lot of people were wasting their time. It seems that I have successfully turned that 6 step process into a 2 step process: 1) turn an image into a night light lithophane in 1-2 minutes, and 2) print the lithophane from the stl. I hope this tool adds value to you. What you probably need to know is "how does the tool work?" Well it turns out that just a few dimensions really matter to most people (however, I am definitely interest in your feedback which you can send to [email protected]), and I've put the capability in place to let you change those dimensions. Those dimensions are defined in the above picture (which is also present on the tool's page). The "slot diameter" and the "adapter thickness" dimensions are important to make sure that the lithophane is compatible with the night light that you have. The size of the lithophane is mostly determined by the "lithophane height" dimension. The other image dimension is determined by the "lithophane height" and the "picture aspect ratio". For the design tool's viewing purposes, you can specify an aspect ratio, but the final lithophane will use the aspect ratio of the image that you upload. Note that the aspect ratio is defined as the image's width divided by the image's height. Finally, you can use a combination of the "center of curvature shift" and the "image arc angle" to control how close the lithophane is to the light and how flat the lithophane is. To make the lithophane very flat, lower the "image arc angle" and increase the "center of curvature shift."